Thank you for the yarn store link - I love seeing "real" stores. Shopping online is great, but there is nothing that can compare with the atmosphere of the actual yarn store! 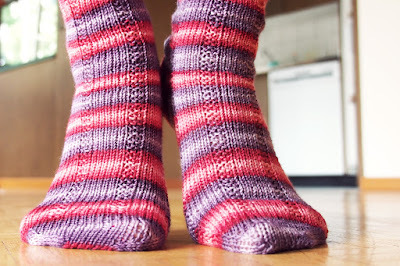 Your socks fit you perfectly! You chose beautiful colors! We don't have yarn stores like that in Switzerland so it was great to go somewhere with yarn that is quite special. 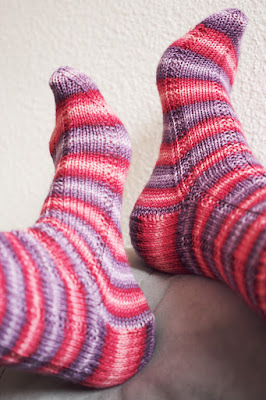 gorgeous colorway and love the striping :) I am hoping to be in a yarn store (or two!) in a few days. It's been a year since I've bought yarn. good luck ;-) I bought lots of yarn online but this was special because it will always remind me of our road trip.